Do you ever walk past the big glass windows of your local gym and ask yourself, “What if?” What if those people on their cardio machines could be doing something useful with their power? The moment is now for Pedal Power spin classes. Although some big challenges will keep the trend from sweeping the nation’s gyms — mostly the costs of replacing traditional spin bikes with power generating ones — the excitement for spin classes that create energy is giving way to real results. Rock The Bike aren’t the only ones working on this project, but we’re the most dynamic. 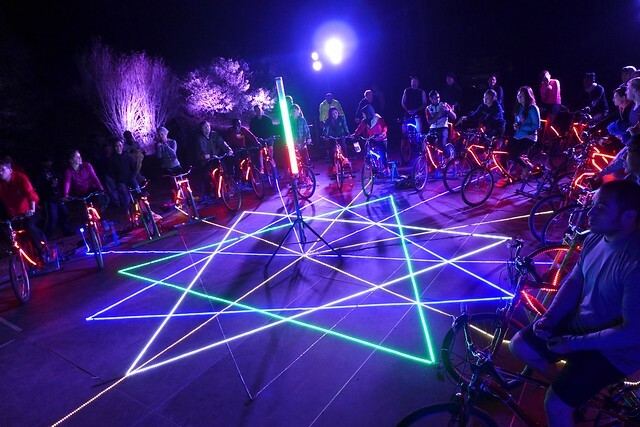 We combine beautiful lighting displays, great sounding DJ rigs, and an intuitive Pedal Power system that responds to the instructor of the class. Pedaling actually feels harder when the instructor calls for an interval, and easier during a rest. The classes are as theatrical as they are physically challenging. Participants really feel they’ve accomplished something together, and they have. The amount of power generated by a participant in a Spin Class may be twice what we expect from a pedaler at one of our concerts, over nearly 80 Watts a piece of continuous usable output power. There’s a critical difference between a regular spin bike and the kind that Rock The Bike uses. Spin bikes generate heat by squeezing the wheel with what are essential large, smooth brake pads. Participants make it feel harder or easier by adjusting a knob on their handlebars. In a Pedal Power Spin Class, you can use any of our bicycle generators to allow participants to crank out usable DC power from the bikes. What makes it feel harder or easier is varying the amount of output load that is connected to the system. This can be as simple as flipping a switch and adding more wattage to the load at key moments. You can either turn on additional lighting or dump increasing amounts of power back into the grid to vary the load. The latter is the way to allow pedalers to directly offset the energy consumption of the gym. As soon as you flip on that additional load, the Pedalometer will drop. Pedalers have to work harder to keep it in the green. Simple as that. 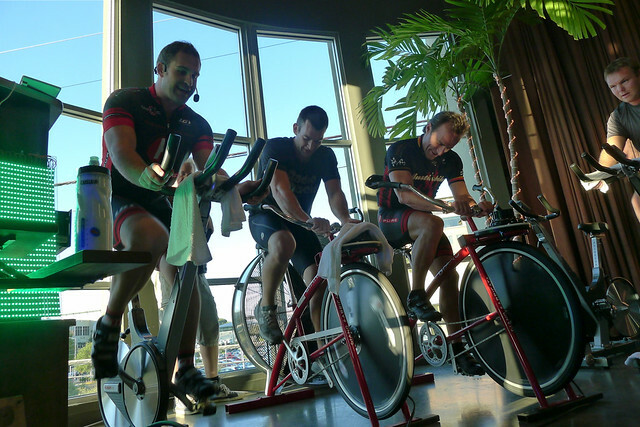 The work in LA this January was the second iteration of our Pedal Power Spin Class. The first was was a 2-bike system done in collaboration with Pure Austin Fitness in Austin, TX. The two generators kept the sound system pumping a live mix by DJ Manny. 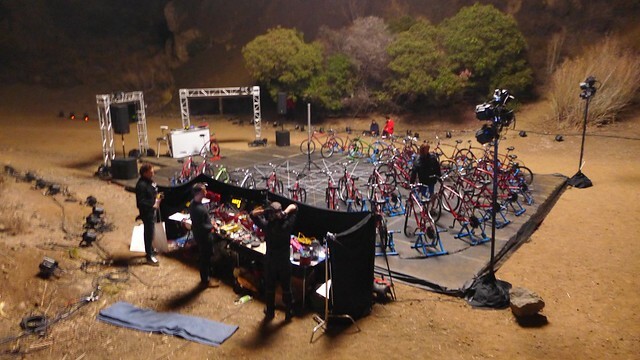 The second was the 30-bike system shown above, handling power peaks of over 3500 Watts.